Braising (or pot roasting) is just a technique that slow-cooks food in a little flavorful liquid. It’s a close cousin to stewing, but uses much less liquid during cooking. Heat oven to 400°F. Cook bacon in large deep skillet or Dutch oven until crisp; remove from pan, cool, and crumble. Set aside. Season chicken with salt and pepper. Brown in bacon fat. Remove to plate. Add cabbage, squash, onion, and fennel seed to pan. Cook and stir 10 minutes. Return chicken to pan; pour in beer. Bring to a boil. Cover pan; place in oven. Bake 35 to 40 minutes or until chicken is no longer pink near bone or in center. 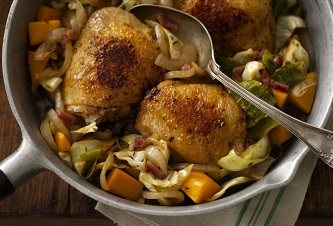 Serve chicken with vegetables, sprinkled with bacon and a dollop of mustard. Cut-up Gold'n Plump® Whole Chicken or Gold'n Plump® Drumsticks may be substituted for the Gold'n Plump® Bone-In Chicken Thighs.